The National Space Society (NSS) wrapped up its 36th annual International Space Development Conference (ISDC) Monday in St. Louis, the birthplace of the Mercury and Gemini spacecraft that propelled the U.S. into manned space exploration. The ISDC was hosted by the local NSS chapter, St. Louis Space Frontier, and held in the historic St. Louis Union Station hotel and convention center. 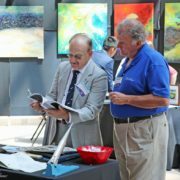 A full agenda of presentations attracted attendees and exhibitors from around the world, and St. Louis aerospace education organizations were there to support the weekend’s activities. 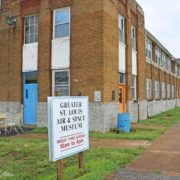 Some of the exhibitors on Saturday included:The Greater St. Louis Air & Space Museum, Missouri Aviation Historical Society, The Space Museum Bonne Terre Missouri, and Mac’s Old Team, among others, provided exhibits at the conference. Exhibits were available daily during the conference days Friday-Sunday, and lunch sessions included keynote speakers NASA Space Shuttle Astronaut Dr. Linda Godwin, Gemini and Apollo Astronaut and retired USAF General Thomas Stafford and World View Enterprises CEO Jane Poynter. Of special interest was the Saturday Panel Presentation and Luncheon with members of Mac’s Old Team, a group of St. Louis-based McDonnell Aircraft engineers who helped design, build and launch the Mercury and Gemini spacecraft at the dawn of the U.S. manned space program. More from Saturday’s Mac’s Old Team program will be featured in an upcoming story.